Tauroctony and Feast at Louvre – Mithraeum. Our Common Sun. White marble relief on a travertine base (H. 0.10 Br. 0.76 D. 0.50). Worked on two sides. Found at Fiano Romano �couch� dans un petit r�duit de briques� in 1926. Paris, Louvre. Probably second century. 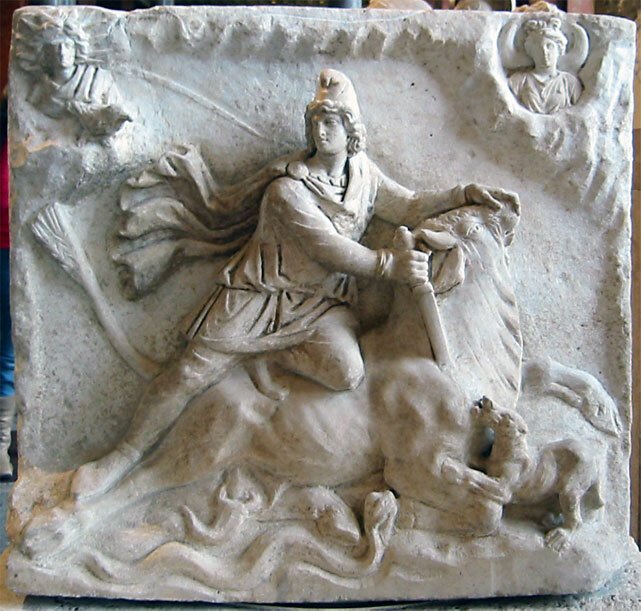 Obverse: Mithras, slaying the bull, whose tail ends in a bundle of ears. The dog, serpent, scorpion and raven. The upper corners are occupied by a rocky vault, from which the dressed busts of Sol (l) and Lune (r) emerge. Luna has a crescent behind her shoulders; around Sol's head acrown of twelve rays and another, which darts out in the direction of Mithras. Reverse: In the middle, a bull's hide, of which the head and one hindleg are clearly visible. Sol and Mithras lying on it side by side. Mithras in Eastern attire, holding a long torch in his l.h. and stretching out his r.h. behind Sol. The latter is only dressed in a short cape, fastened on the r. shoulder by a fibula. Around Sol's head an aureole and a crown of eleven rays. He holds a whip in his l.h. and extends the other hand towards a torchbearer, who stands before him and offers him a rhyton. Another torchbearer, dressed in Eastern attire like his companion, and with an upraised torch in his l.h., holds with his right a caduceus in the water or fire, which comes out from the ground. Beside it an altar in the coils of a crested snake. In the left upper corner a cloud-like semicircle, in which the dressed bust of Luna with a crescent behind her shoulders. She looks away from the scene. Traces of red painting on the attire of the torchbearers and the reclining persons. Dating: II century A.D. – III century A.D.